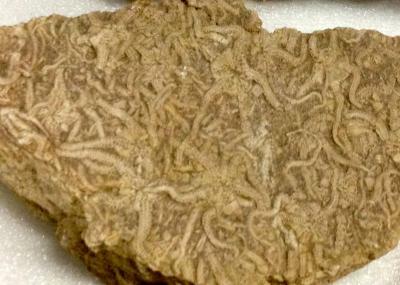 This week on Fossil Friday, I gave you what looked like a plate full of ramen noodles—or maybe it was plain old spaghetti. Nope. Raymond King knew it almost right away: it was a slew (a herd? a flock? a murder?) of brittle stars. Meanwhile Dan Coleman guessed that it came from the Miocene—good call! Thanks for playing this week! Stay tuned for more fossil fun this Friday! National Center for Science Education, Inc.